Despite the size of the industry, there does not appear to be any one particular player who is currently getting their SEO right. We have therefore examined eight core brands in the market to find out how they are faring and what they could look to do better in order to better exploit the sizeable opportunities available in this market. There are some industries where links do not come easily or naturally. For instance, it is unlikely that there will be too many websites who will regularly link to life insurance companies, simply due to it being a very dry topic which rarely sparks much interest. This is not the case with pet care, as proven by the thousands of cat photos and videos which are shared online every single day. Anything centred around animals is natural link bait and as such, the majority of competitors in the industry have natural linking profiles which are unlikely to be penalised for violating Google guidelines. This can be seen with Royal Canin, Wafcol and Applaws, with all three of these websites having natural looking linking profiles consisting mainly of brand based keyword links which are viewed as being at a low risk of penalty by Link Detox. However, a number of the key players in the industry still appear to have suffered issues when Penguin algorithm updates have been rolled out by Google. The most noticeable of which is Purina who have more links than all seven of the other competitors put together with a combined total of 69,201 links from 190 root domains. For reference, the competitor with the next biggest link total is Royal Canin who have 16,285 links. This in itself will look suspicious to search engines, particularly when you consider that Royal Canin are generating this lower link figure from a larger number of root domains (624 in total). It is possible that this is causing Purina some problems if Google does not fully understand the structure of their websites internationally. Indeed, the lack of href lang or rel=alternate tags suggests that international SEO has not been implemented appropriately. Iams also appear to have fallen foul of this, with over 50% of their links coming from irrelevant keywords on different variations of their websites internationally. This has resulted in Link Detox considering them to have a domain which is at a high risk of a Google penalty. On top of these issues, both Purina and IAMS also have a number of low quality directory links. It is not uncommon to find these in linking profiles and search engines will be fully aware that these are not created through the intention of the webmaster. However, there appears to be a larger number of these in these profiles than is the case with other pet sites analysed. A further issue for Purina is that they also have a number of links from websites such as leashestolitterboxes.com which are displaying malware warnings. Iams meanwhile have never achieved the search visibility that their brand deserves given the recognition it has off-line. It is likely that their visibility would increase significantly if they could address these long standing issues which have been mentioned. However, they also have a higher percentage of keyword based links in their profile than the other competitors analysed so far, with there also being signs that they may have previously utilised sidebar banner placements as a means of link generation. This is a technique which is against webmaster guidelines and is a common reason for link penalties and ranking drops. This tactic also appears to have been used historically by Skinner’s Pet Foods, with data from Open Site Explorer suggest that this style of link accounts for over 25% of their linking profile which is made up of 1,454 links from 169 root domains. As with the other competitors examined, there is also a large number of links from low quality directories, but this is countered with links from a number of high quality domains such as peta.org.uk as a result of positive PR outreach tactics. Visibility gradually increased back to normal levels over the course of the next 12 months, suggesting that efforts were made to clean up the linking profile. However, there was another sharp but less substantial decline in December 2014 after the roll out of the Penguin Everflux algorithm which suggests that the linking profile of Skinner’s Pet Foods has not yet been cleaned up sufficiently to prevent them from suffering search visibility drops. The only competitor analysed who appears to have suffered a Manual Action Penalty is Arden Grange, who suffered a drop in visibility in September 2013 which does not coincide with any known algorithm update. This is unexpected, as the linking profile to their site appears to be quite naturally featuring a high percentage of brand based links and having been classified by Link Detox as a relatively low risk domain with just 11% of the links in the profile considered to be a high audit priority. For reference, this compares to 18% on Iams. It appears that this could be related to the high number of links generated from low quality foreign directories such as 2link.be, expertpagina.nl and startkabel.nl. It would be unusual for Google to consider these the result of active outreach efforts, but it is not completely unheard of. Nevertheless, the issue appears to have been quickly dealt with, and search visibility returned to previous levels over the course of the next three months. As with links, it is comparatively easier to generate a strong and engaged social following for brands in this vertical than it is for those in other less sharable industries. 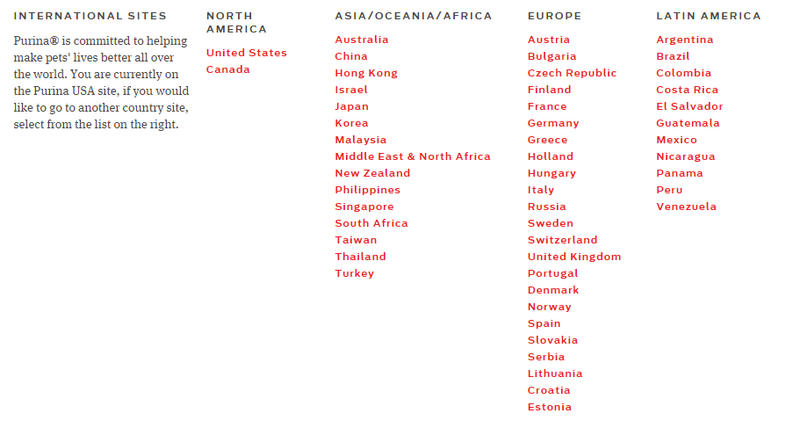 The two brands with the largest social following in this vertical currently are unsurprisingly the international brands. This includes Purina with 37,500 Twitter followers and 450,000 likes on Facebook, and Iams who have over 16,500 Twitter followers and 730,000 likes on Facebook. However, Purina in particular go a long way beyond this by providing useful pet owning tips for followers using their #‎PetLifeHack‬ hashtag which often prompts much discussion between the brand and its followers. They also encourage users to engage with them on other social channels, including Pinterest by asking users to contribute to Pinterest boards such as their recent spring campaign. 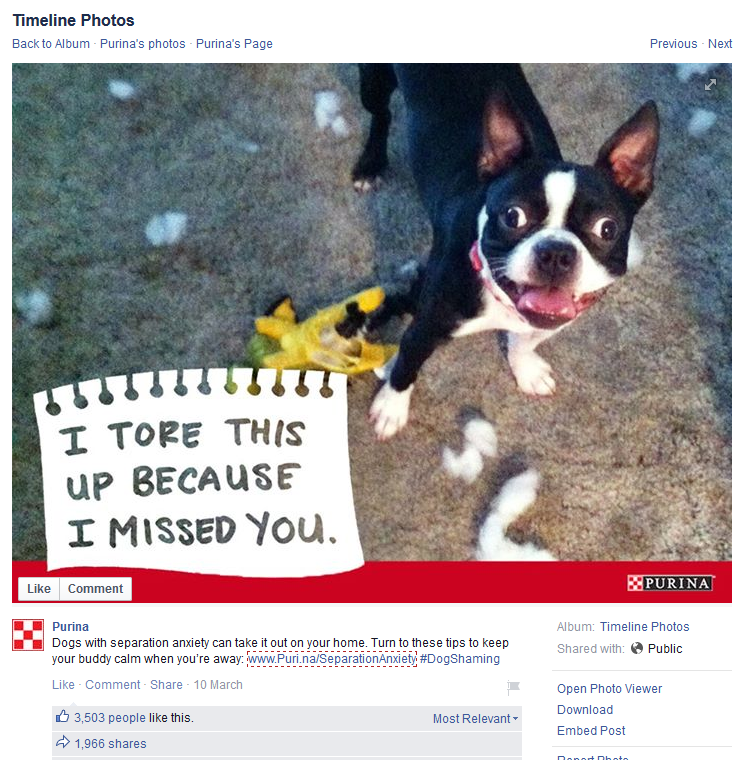 Purina are also active on Google+ with 857 followers and having recorded over 300,000 views on their profile. This is often a forgotten channel given its lack of users in comparison to Twitter and Facebook. However, from an SEO perspective it is still very important as it gives brands the opportunity to increase their search visibility in results, particularly for local search queries. Google will also likely find it far easier to measure user engagement with a brand on Google+ than on either Facebook or Twitter, a factor which is strongly believed to be part of their overall ranking algorithm. In fairness, many of the brands analysed follow a similar social strategy, including Burns Pet Nutrition, Arden Grange, Skinner’s Pet Foods and Applaws. The only brand which is currently not making any effort to engage with users on social channels is Wafcol. This is a significant lost opportunity, as they are not harnessing relationships with customers or developing the brand awareness or image. This means that they are currently losing ground to their competitors in the social arena. One of the social channels which wafcol.co.uk is currently missing is Google +; the potential significance of which we have already discussed. However, they are not alone in this regard, with Burns Pet Nutrition, Arden Grange, Skinner’s Pet Foods and Applaws also making no effort to utilise Google’s search engine of choice. This is yet another area where Purina and Iams are maintaining a competitive advantage. The majority of SEOs will be sick of hearing the phrase “content is king”, but this message does not appear to have reached those responsible for these websites, all of which suffer from low quality and thin content which in many cases is duplicated heavily externally. Many of the competitors analysed appear to have gotten away without suffering ranking drops on the back of Panda algorithm updates, but it appears that this is only due to the generally poor level of content on all websites across this industry. Those who can be placed in this category are Purina, Burns Pet Nutrition, Iams, Applaws and Wafcol. Skinner’s Pet Foods also fall into this category, and they even appear to have had a small increase in search visibility in late March 2014 after the launch of the Unnamed Update which is believed to have been a softening of the Panda algorithm. Although the content on the home and category pages of this site is thin and under-optimised, they are still significantly better in this regard than many of the other brands who have already been mentioned. However, they do suffer from the same content duplication issues as the other brands mentioned on product pages. This is due to the product descriptions being used to accompany product placements on other websites where these products are being sold. In order to avoid these issues, all the sites should have completely bespoke product descriptions on all landing pages which are not duplicated on any page externally. This is a massive undertaking, but the first pet care site to invest appropriately in on-page content will benefit from massive returns when it comes to search engine visibility. Although the brands already mentioned have got away without suffering ranking drops due to their content inadequacies, Royal Canin do not appear to have been quite as lucky as they suffered a massive decrease in search visibility in May 2014 following the roll out of Panda 4.0. In fairness, an inspection of the website reveals that Royal Canin do not appear to have underperformed in this area any worse than many of the websites mentioned already and in fact their home and category page content is relatively substantial. However, it has been duplicated heavily externally, and this also the case on all product pages. This is an issue which Royal Canin will need to address if they are to recover from these issues. Search visibility for the domain has been in decline ever since and this may correlate to the belief that the Panda algorithm is now running in real time. Home and Category page content on Arden Grange is significantly worse than that on Royal Canin both in terms of quantity and quality, while they also suffer from the same duplication issues particularly on product pages despite the content on these landing pages actually being substantial and informative. Looking ahead to the future, on the 21st April 2015 Google will be rolling out its mobile algorithm. So what can we expect from each of these websites at this point? Royal Canin, Burns Pet and Applaws should be in a great position to capitalise on this algorithm change as all three already have a responsive design in place. This means that the page format changes automatically depending on the size of screen utilised by the user without the URL structure changing. This is an approach to mobile SEO which is advocated by Google, and in theory all three of these websites such benefit from an increase in search visibility at this time. The reason for this is possibly local SEO, with Royal Canin’s simply linking out to the domains of local stockists rather than having their own bespoke landing pages to accommodate local keyword queries. With more local based queries naturally being conducted on mobile devices, it is possible that this is resulting in them losing out compared to their competitors who are providing landing pages for such keywords and are also able to create Google+ business pages which are appearing in the local SEO pack. Both of these factors will be resulting in Royal Canin listings featuring lower down in the overall search results. Nevertheless, this trend may well change upon the launch of the Google mobile algorithm and it will be fascinating to see if this transpires. Sites which may actually suffer as a result of this are Purina, Iams, Arden Grange, Skinner’s Pet Foods and Wafcol as these websites don’t make any attempt to cater for the needs of those on mobile devices, either by the use of a responsive website design or even a separate mobile landing page. Despite this, Skinner’s Pet Foods are a big winner when it comes to mobile visibility currently, with their mobile search visibility being 15% higher than for overall search according to the Search Metrics data. This does not correlate with the local SEO theory, as Skinner’s also employ the same technique as Royal Canin when it comes to listing local stockists. This suggests that this could either be an error in the Search Metrics calculations for this tool (which is currently in Beta) or that Google is currently getting very wrong when it comes to assessing the mobile experienced offered by websites in this vertical. Either way, it will be fascinating to see what impact the upcoming algorithm change has on these websites and whether or not those who have made an effort to accommodate mobile users are rewarded. 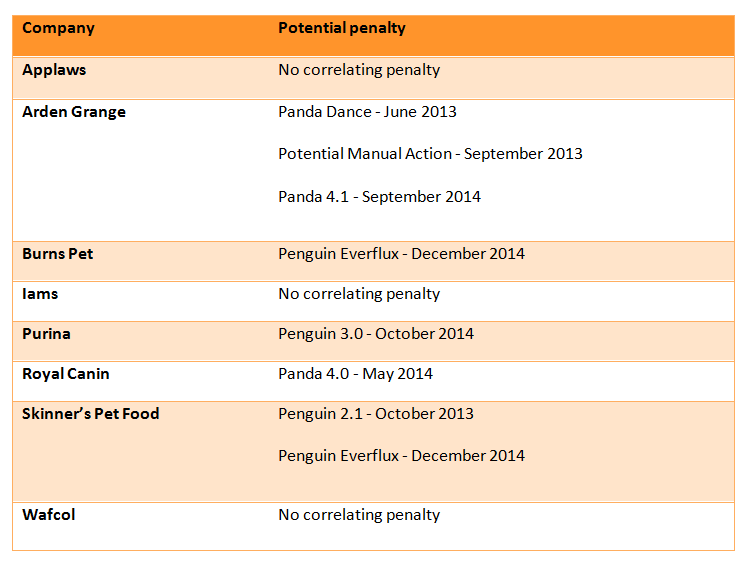 Below is a summary of the potential penalties that may have hit each website.